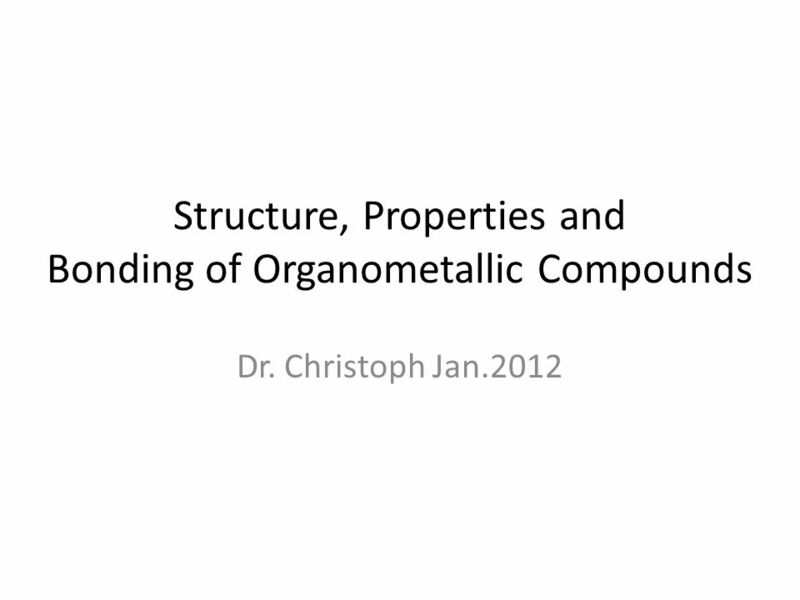 Structure, Properties and Bonding of Organometallic Compounds Dr. Christoph Jan.2012. 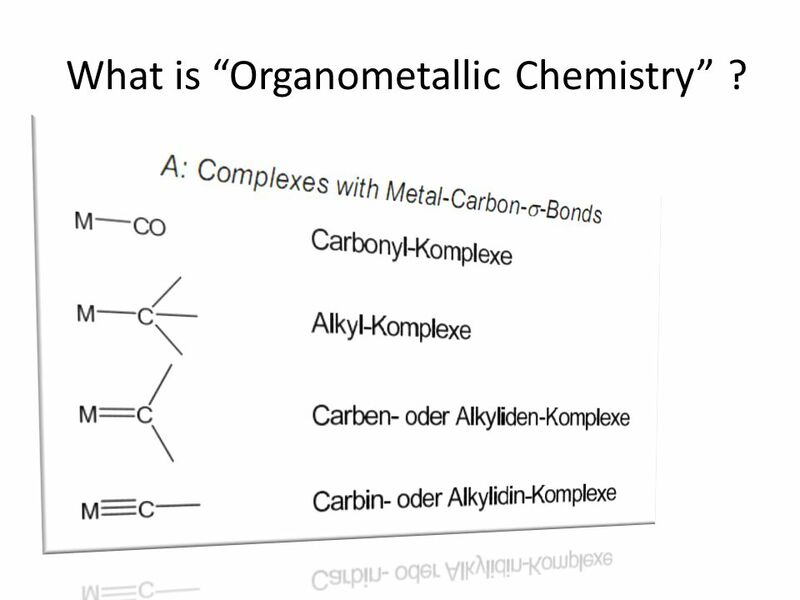 2 What is “Organometallic Chemistry” ? 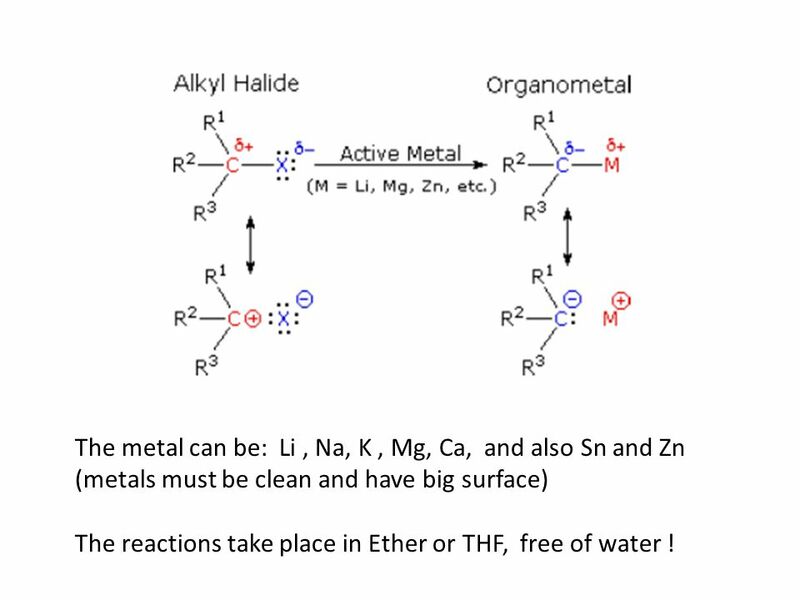 5 The metal can be: Li, Na, K, Mg, Ca, and also Sn and Zn (metals must be clean and have big surface) The reactions take place in Ether or THF, free of water ! 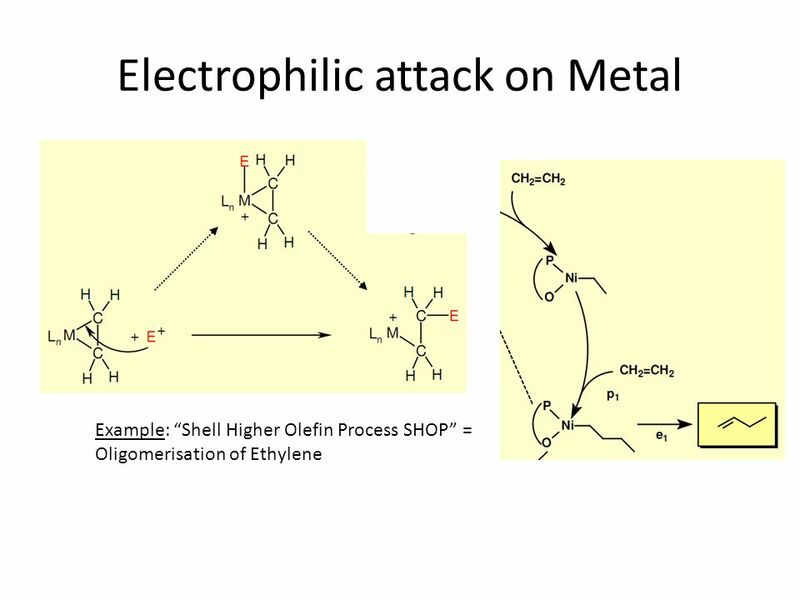 9 Transition Metals Low EN High Oxidation States “hard” metal centers Higher EN Low Oxidation States “soft” metal centers Note that we count the two s- electrons of the atom together with the d- electrons ! 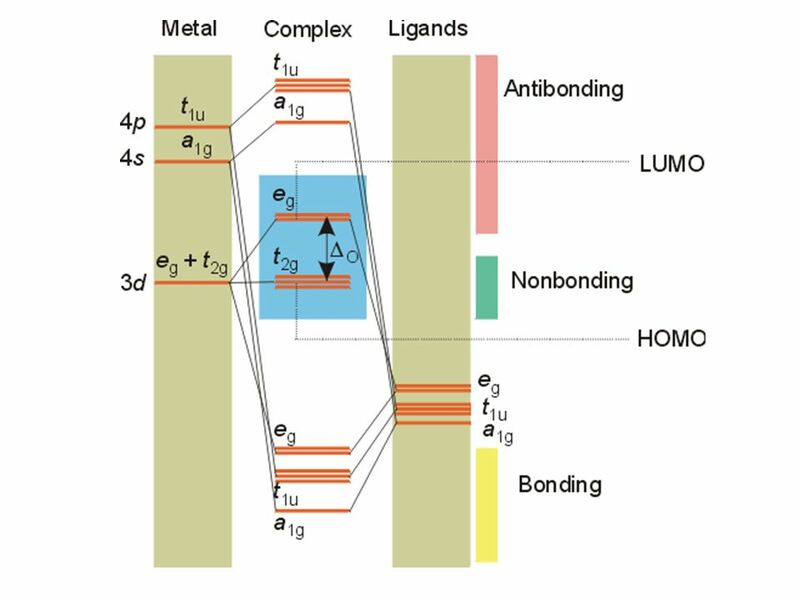 For example Ti atom has 4s2, 3d2 BUT we count it as 4 d-electrons in a molecule with Ti ! 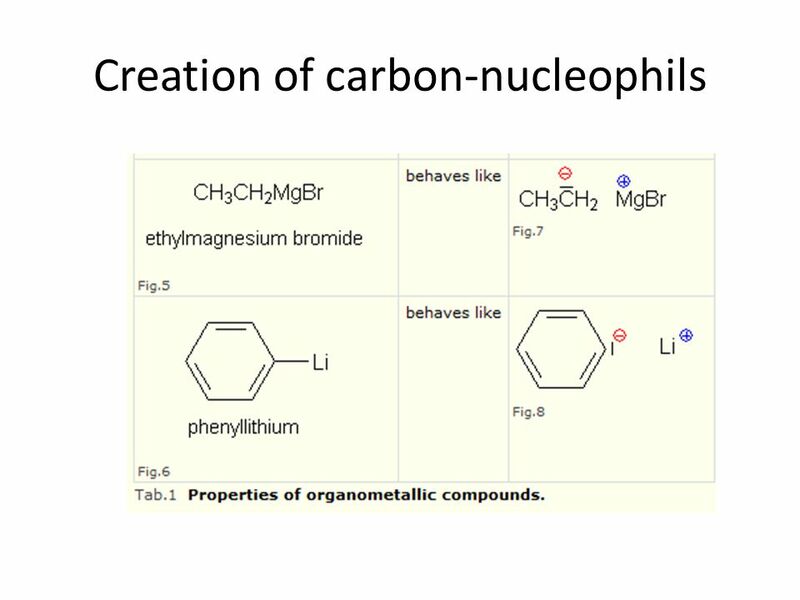 10 First organometal compounds Note that the ethylene molecule is NOT flat anymore but has some sp3 hybridization on the carbons ! 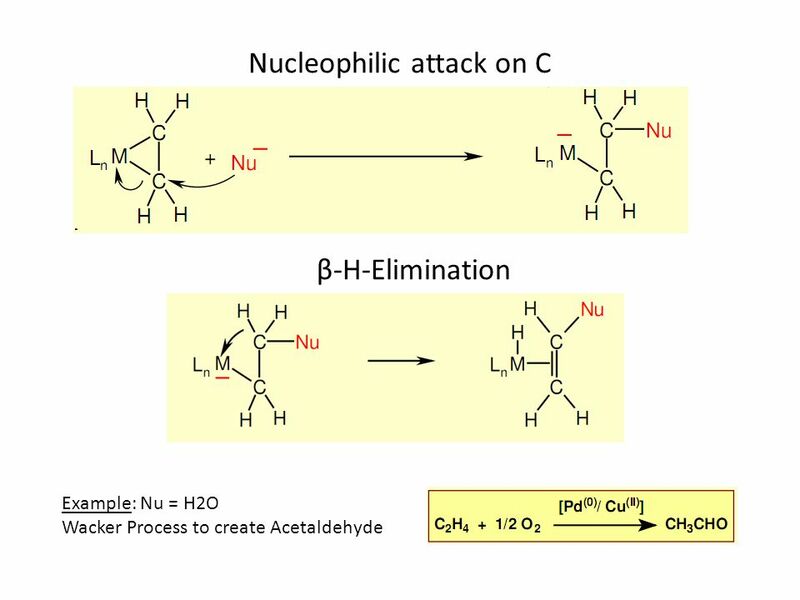 That means also that the C=C bond is not a complete double bond anymore ! 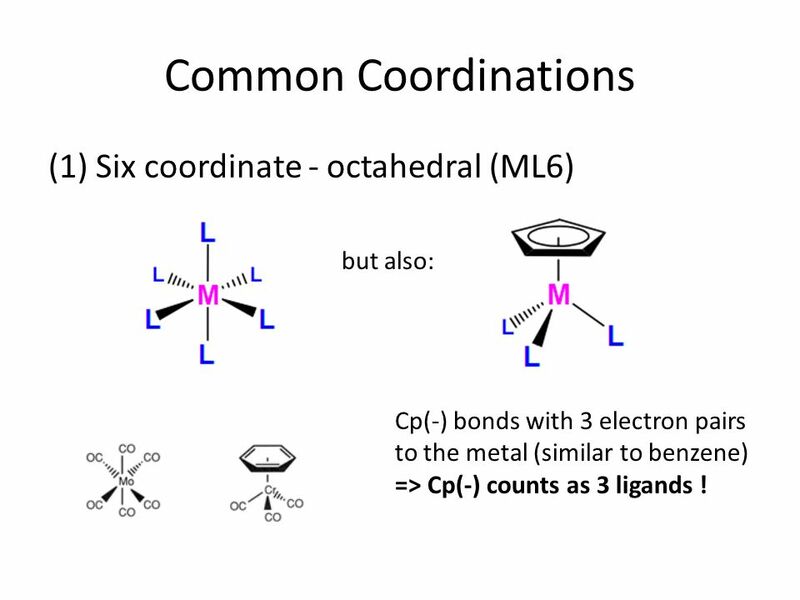 14 Common Coordinations (1) Six coordinate - octahedral (ML6) but also: Cp(-) bonds with 3 electron pairs to the metal (similar to benzene) => Cp(-) counts as 3 ligands ! 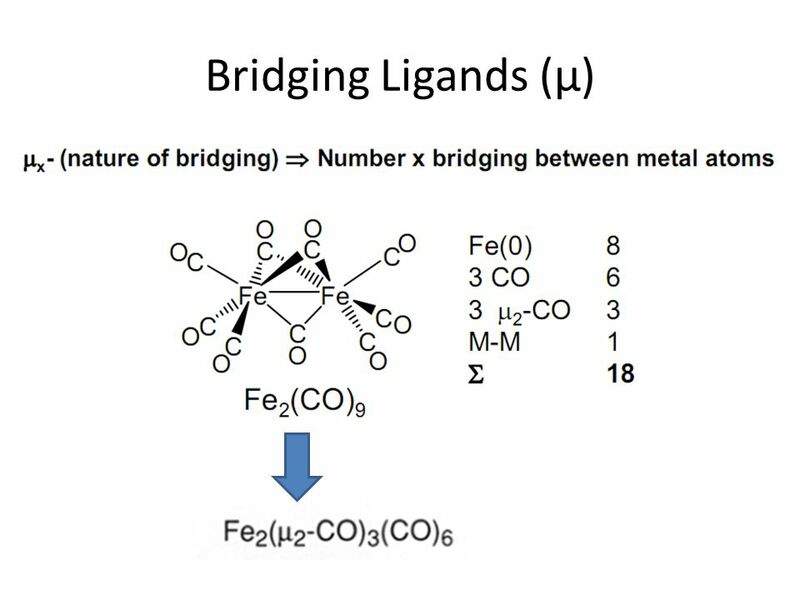 18 That means also that a ML6 molecule can exist with 12 valence electrons up to 22. 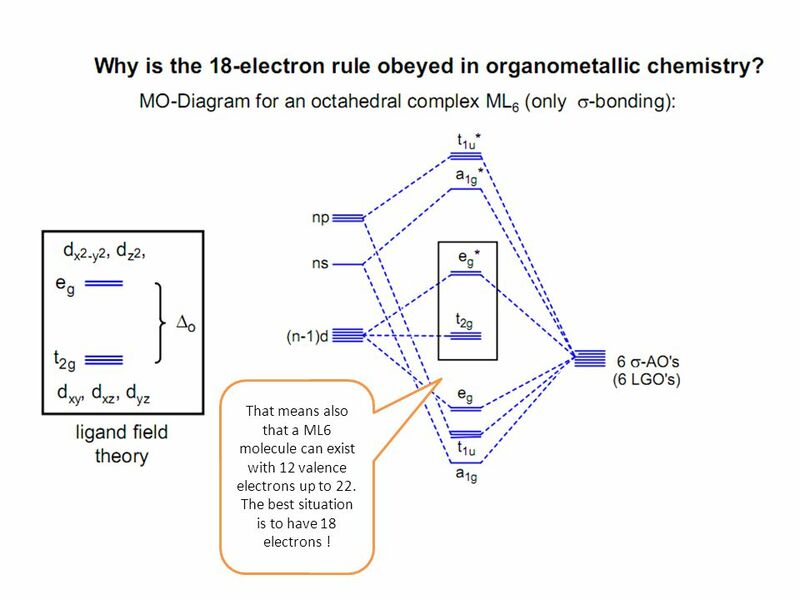 The best situation is to have 18 electrons ! 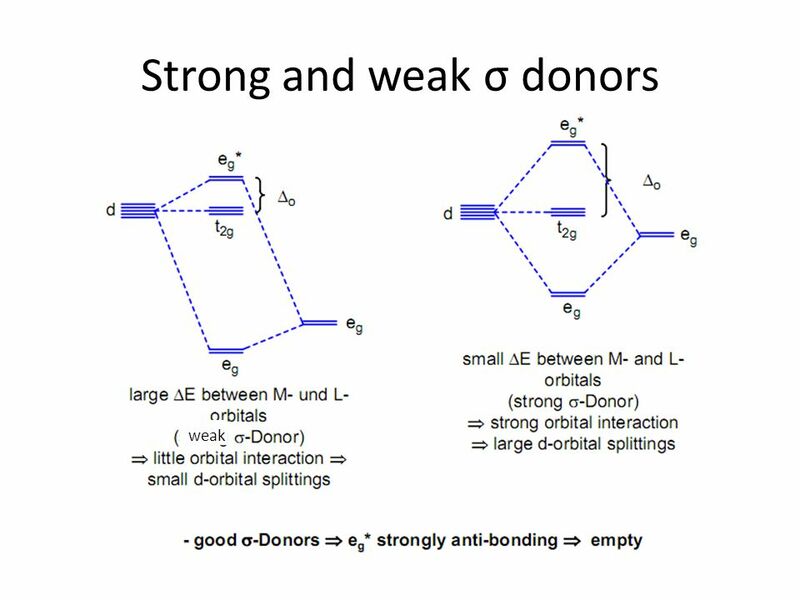 19 Group Orbitals from ligands: For a σ donor ligand, we consider just the electron pair that donates electrons. 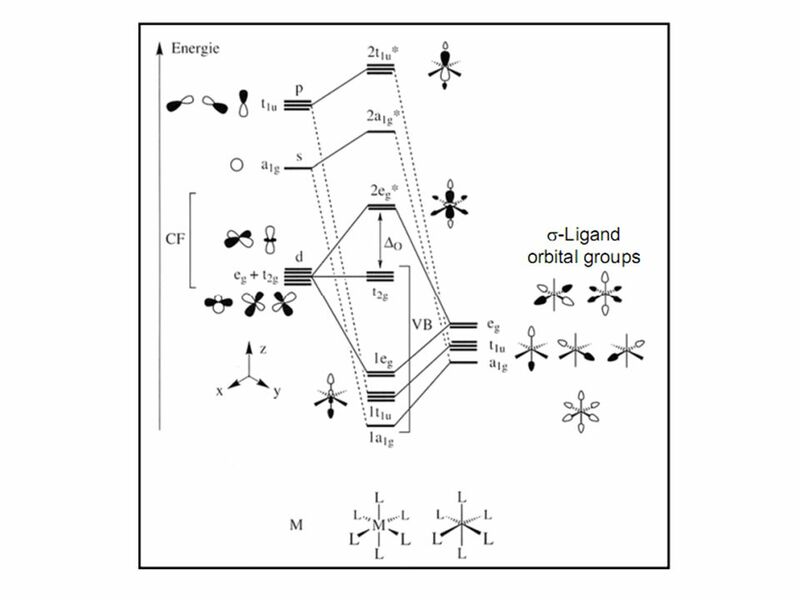 We combine 6 ligand orbitals (whether in s- or p-AO does NOT matter !) 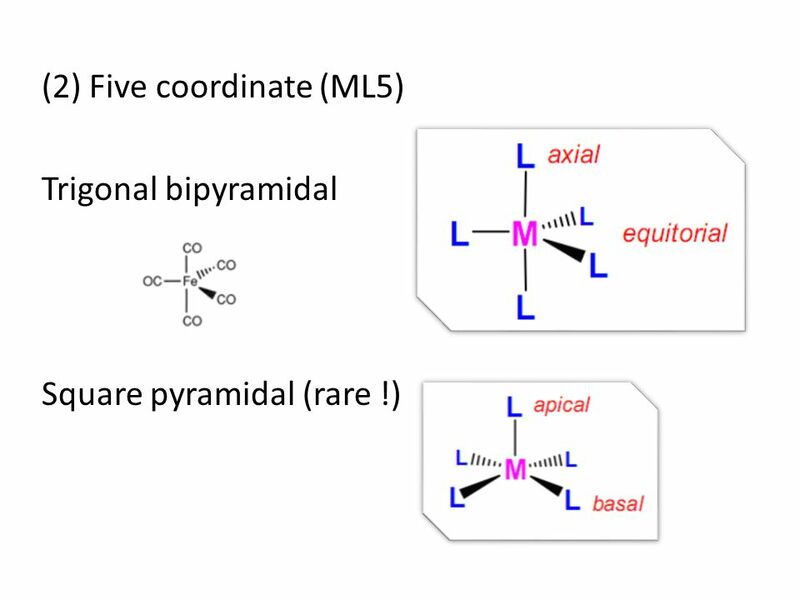 to 6 SALCs (Symmetry Adapted Linear Combination) SALC = combination of the 6 ligand AO’s spherical around the center of an octahedron. 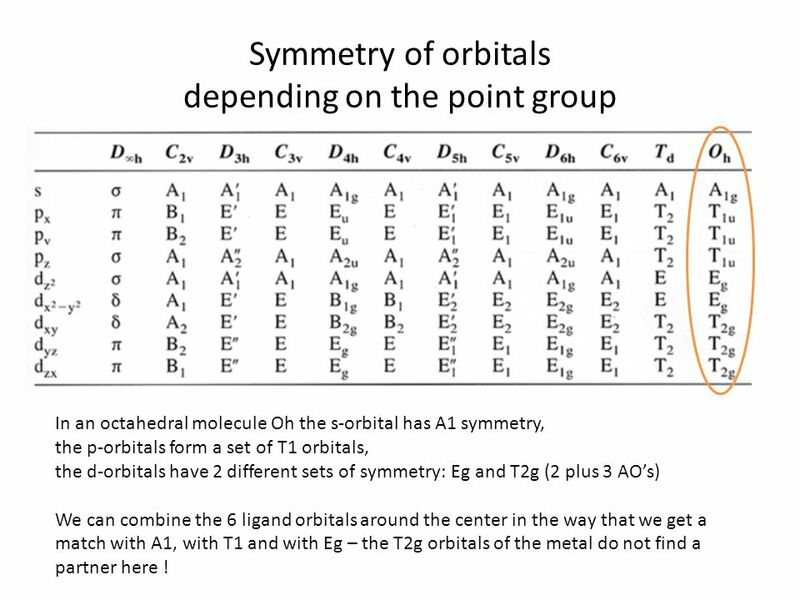 20 Symmetry of orbitals depending on the point group In an octahedral molecule Oh the s-orbital has A1 symmetry, the p-orbitals form a set of T1 orbitals, the d-orbitals have 2 different sets of symmetry: Eg and T2g (2 plus 3 AO’s) We can combine the 6 ligand orbitals around the center in the way that we get a match with A1, with T1 and with Eg – the T2g orbitals of the metal do not find a partner here ! 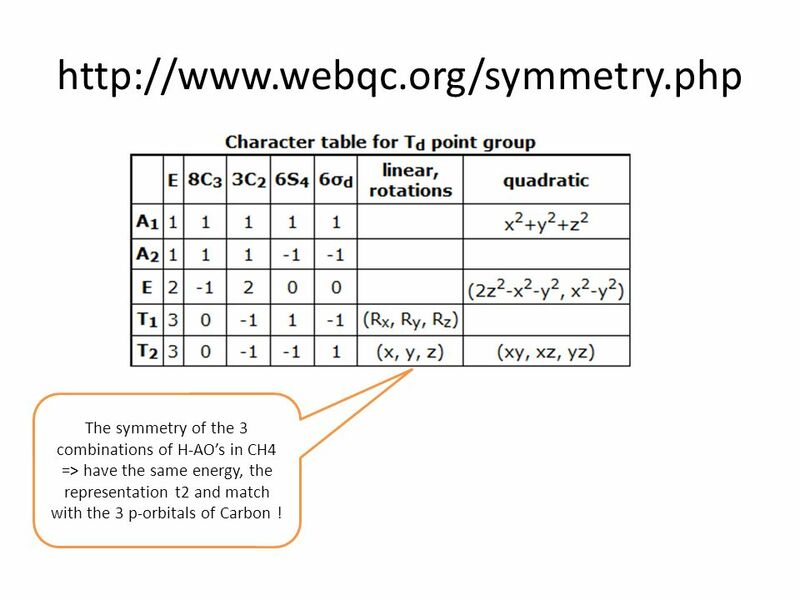 26 http://www.webqc.org/symmetry.php The symmetry of the 3 combinations of H-AO’s in CH4 => have the same energy, the representation t2 and match with the 3 p-orbitals of Carbon ! 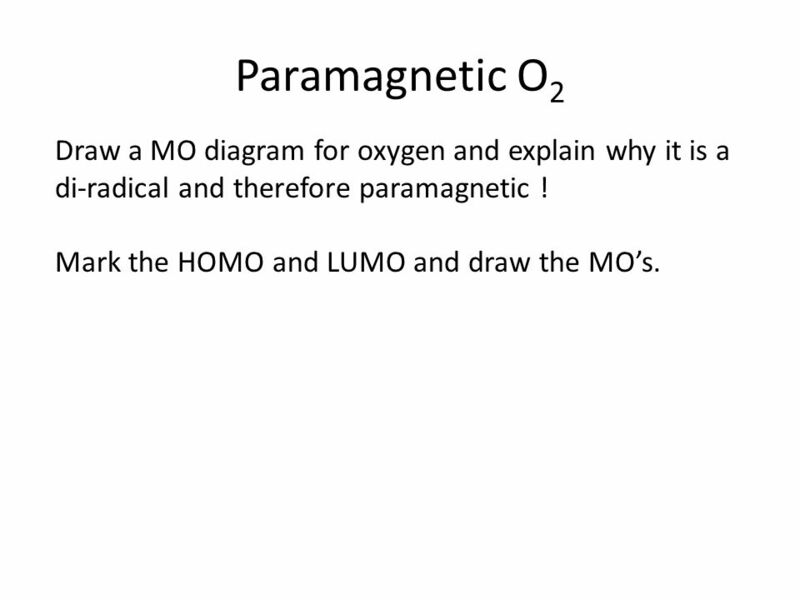 28 Paramagnetic O 2 Draw a MO diagram for oxygen and explain why it is a di-radical and therefore paramagnetic ! 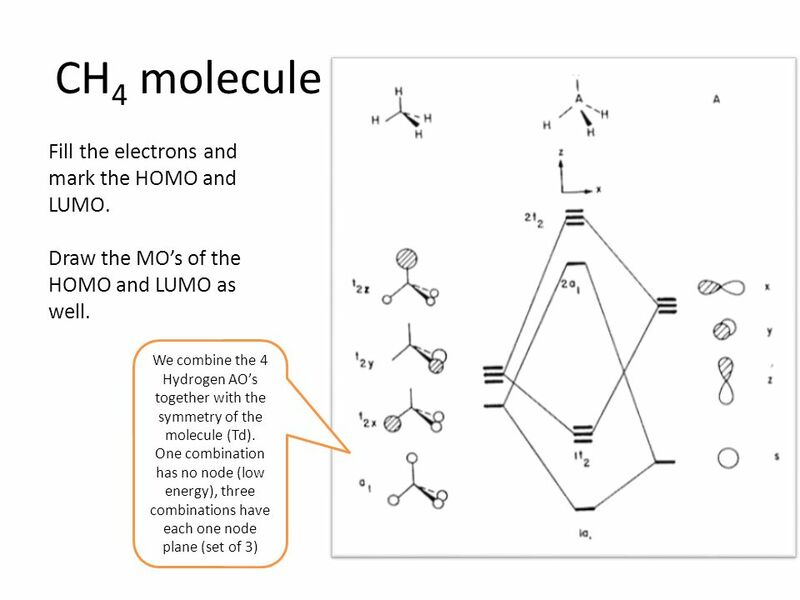 Mark the HOMO and LUMO and draw the MO’s. 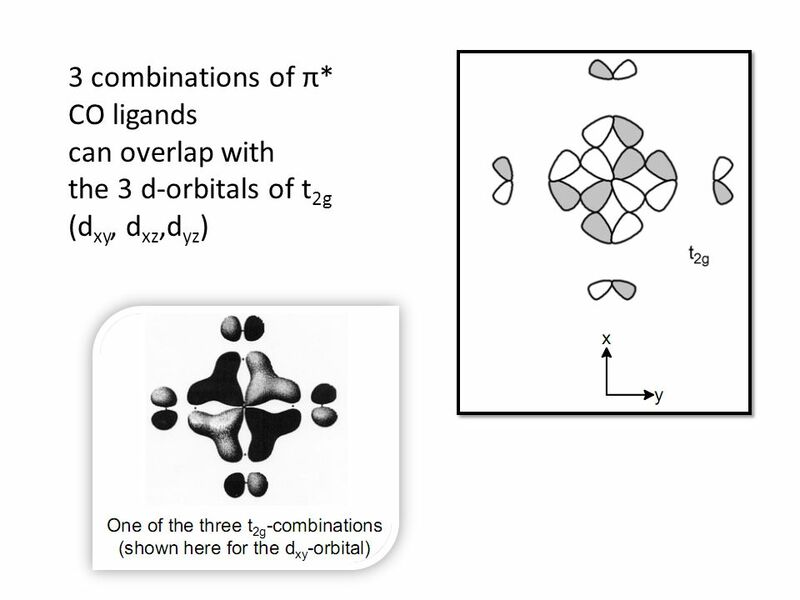 29 This MO is lower in energy than the π- orbitals because of bigger overlap. 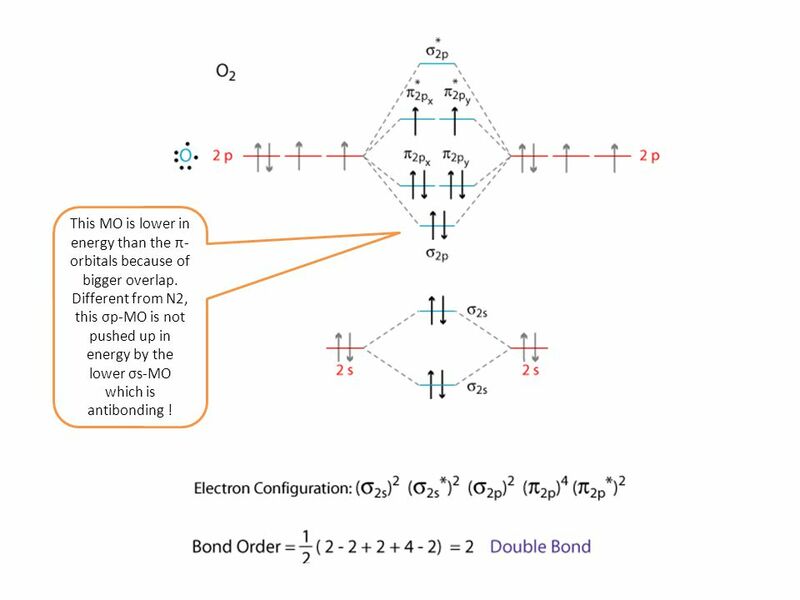 Different from N2, this σp-MO is not pushed up in energy by the lower σs-MO which is antibonding ! 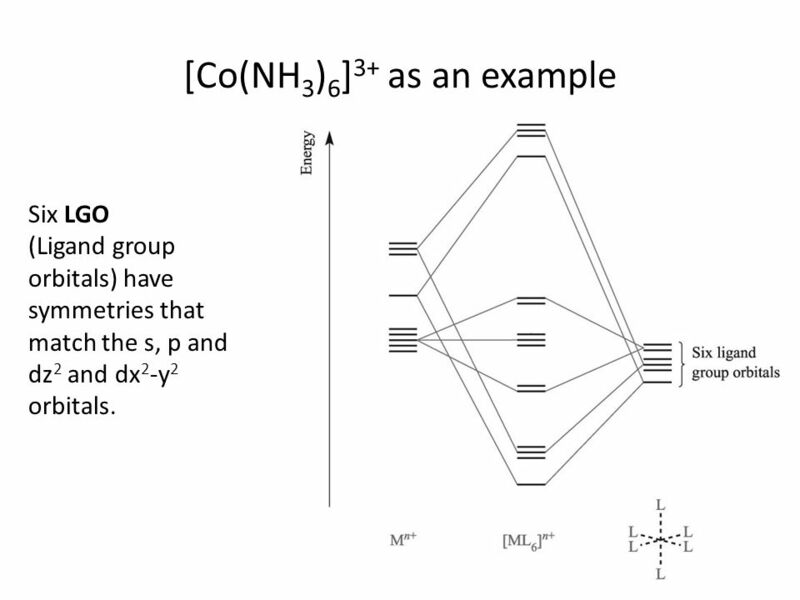 31 [Co(NH 3 ) 6 ] 3+ as an example Six LGO (Ligand group orbitals) have symmetries that match the s, p and dz 2 and dx 2 -y 2 orbitals. 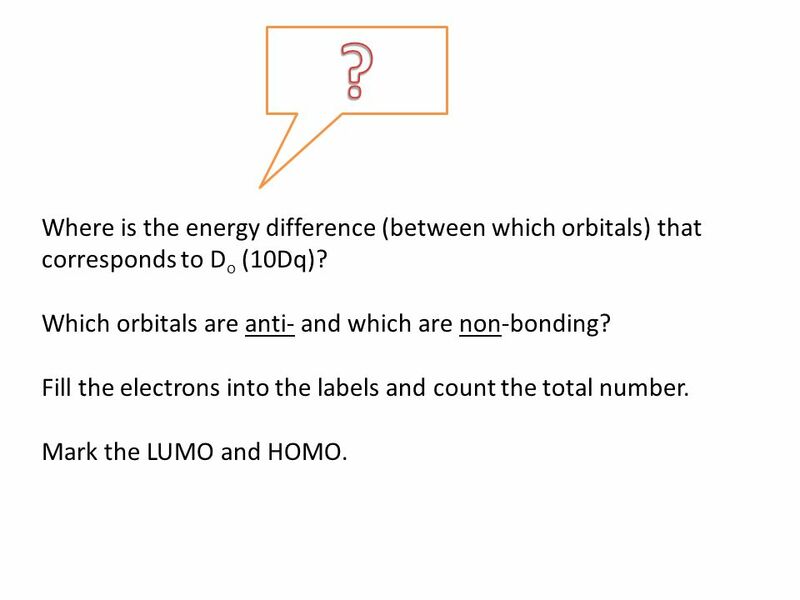 32 Where is the energy difference (between which orbitals) that corresponds to D o (10Dq)? 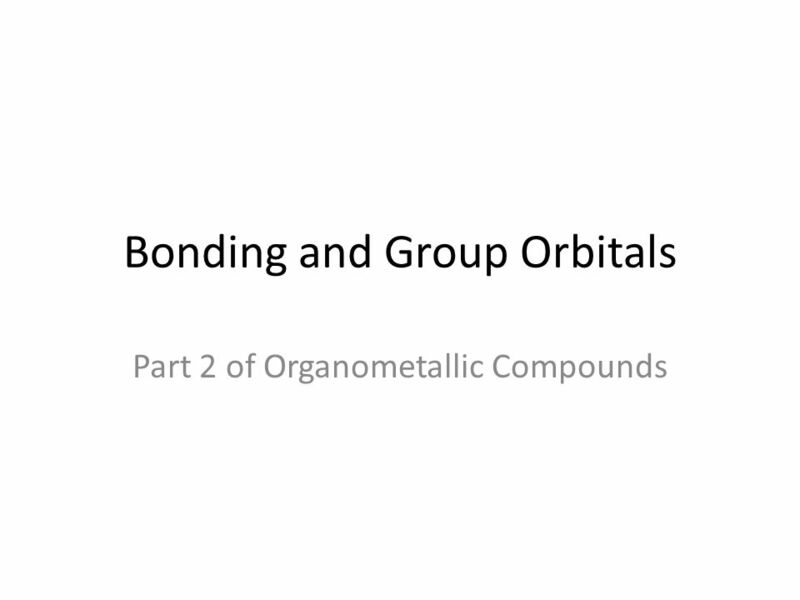 Which orbitals are anti- and which are non-bonding? 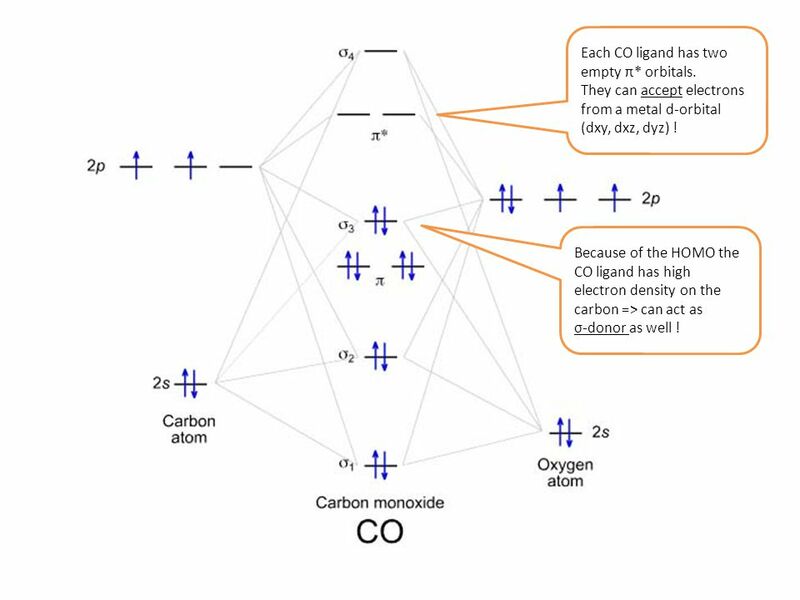 Fill the electrons into the labels and count the total number. Mark the LUMO and HOMO. 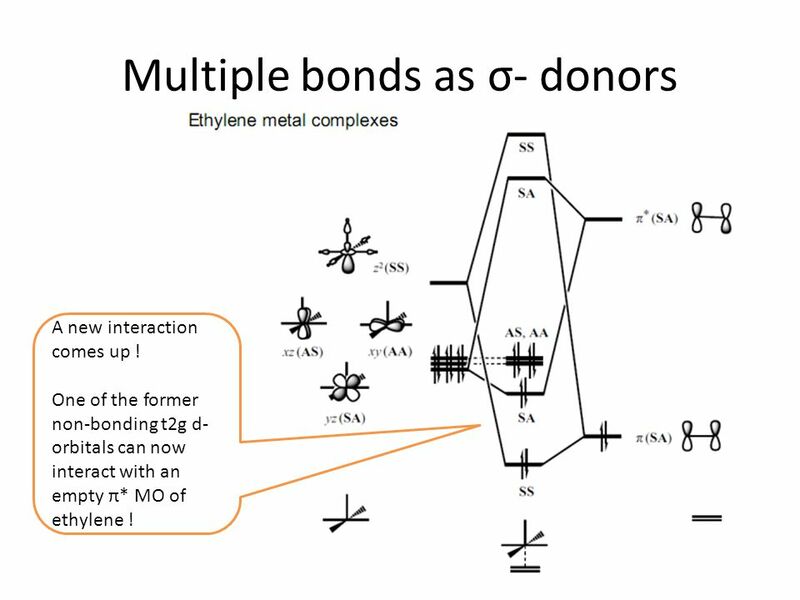 35 Multiple bonds as σ- donors A new interaction comes up ! 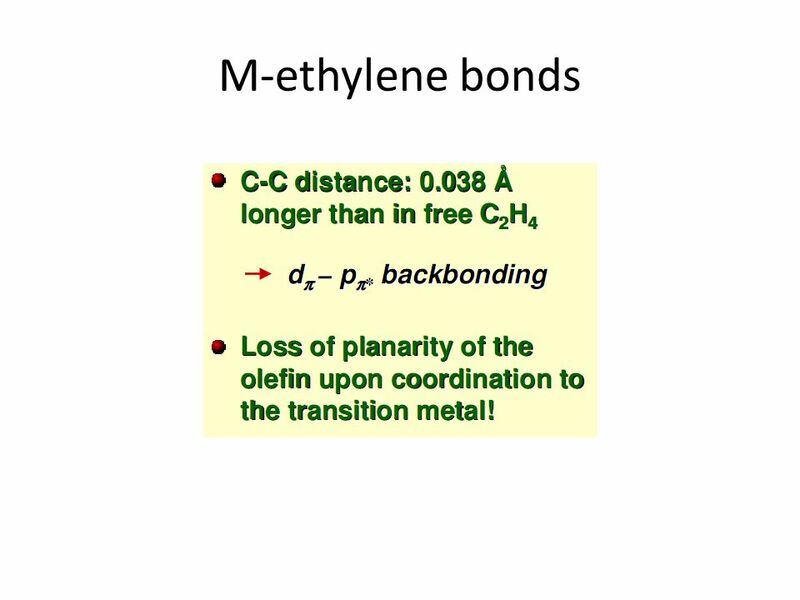 One of the former non-bonding t2g d- orbitals can now interact with an empty π* MO of ethylene ! 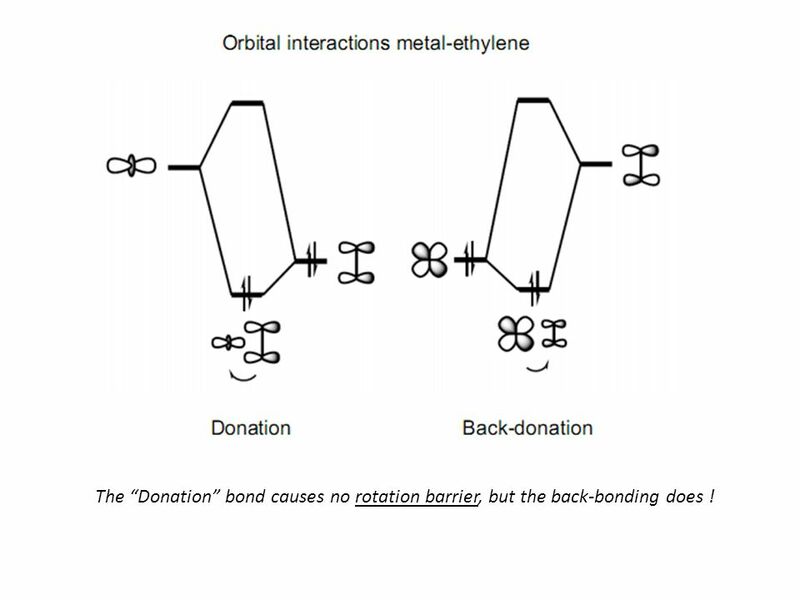 36 The “Donation” bond causes no rotation barrier, but the back-bonding does ! 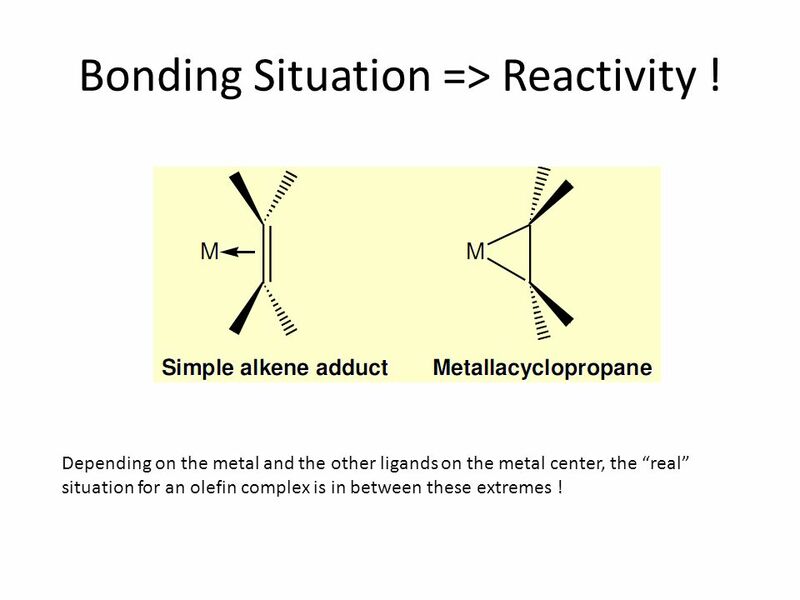 39 Bonding Situation => Reactivity ! 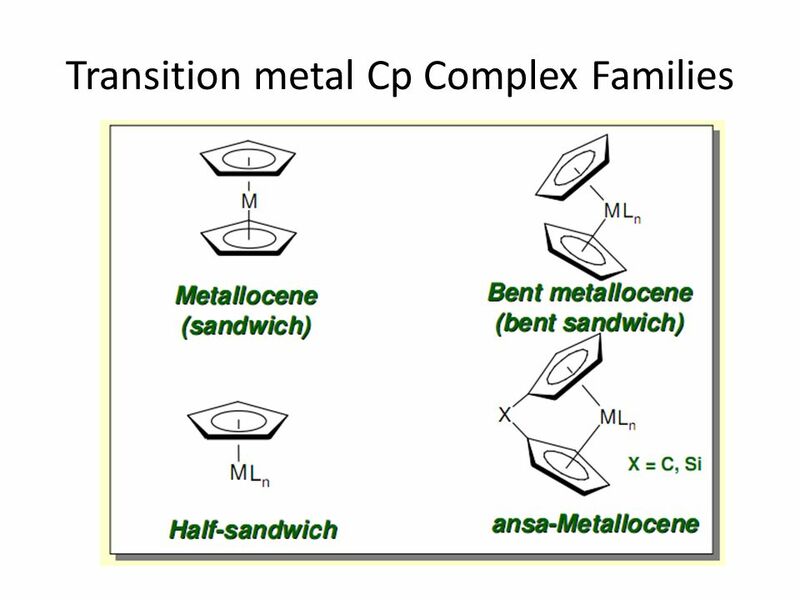 Depending on the metal and the other ligands on the metal center, the “real” situation for an olefin complex is in between these extremes ! 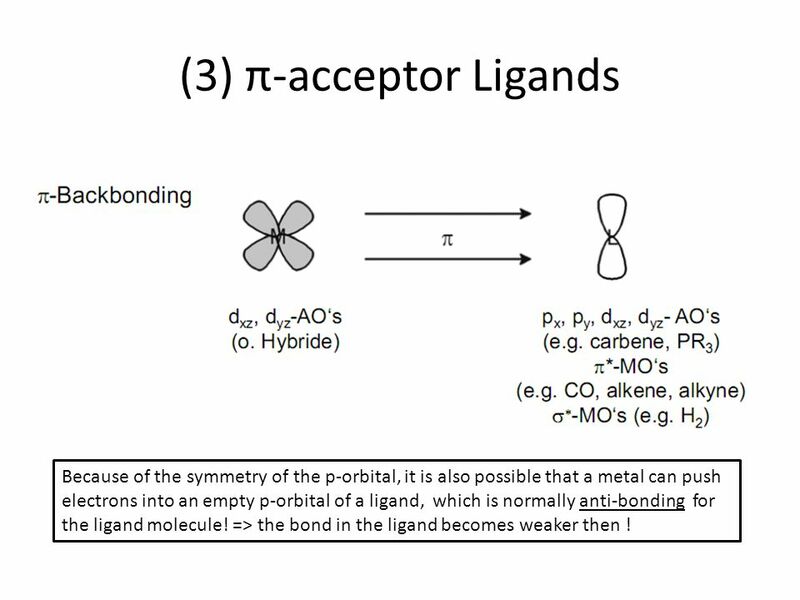 46 (3) π-acceptor Ligands Because of the symmetry of the p-orbital, it is also possible that a metal can push electrons into an empty p-orbital of a ligand, which is normally anti-bonding for the ligand molecule! 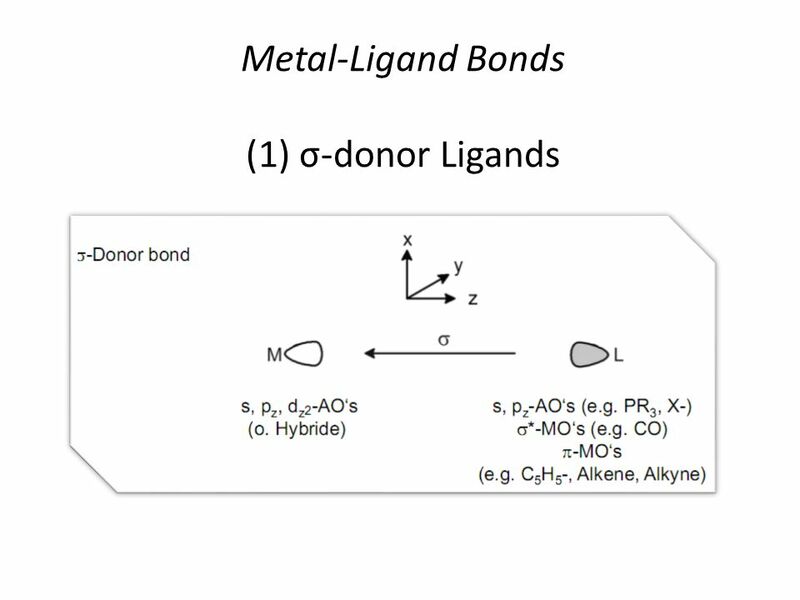 => the bond in the ligand becomes weaker then ! 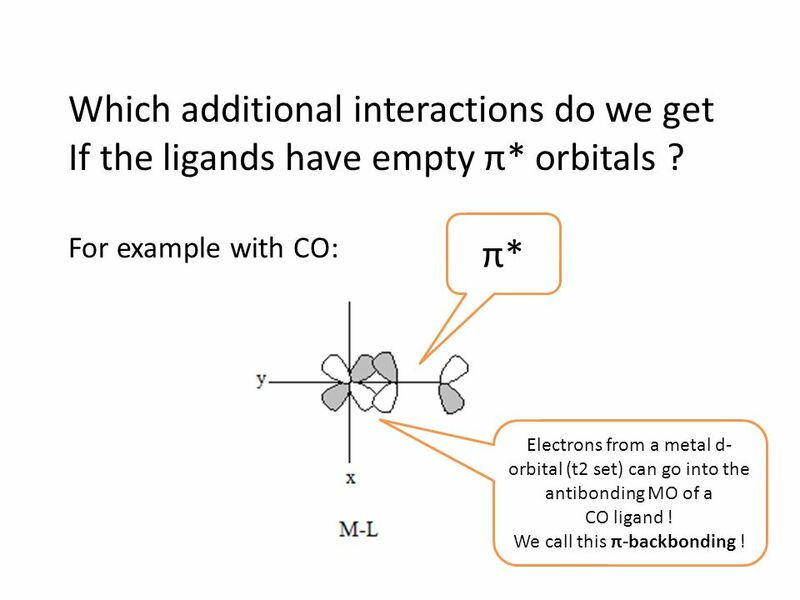 47 Which additional interactions do we get If the ligands have empty π* orbitals ? 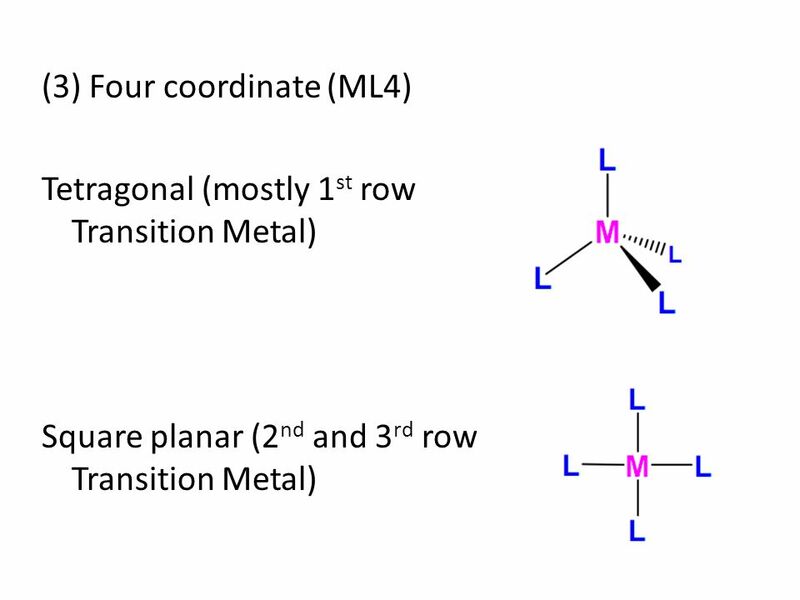 For example with CO: π*π* Electrons from a metal d- orbital (t2 set) can go into the antibonding MO of a CO ligand ! 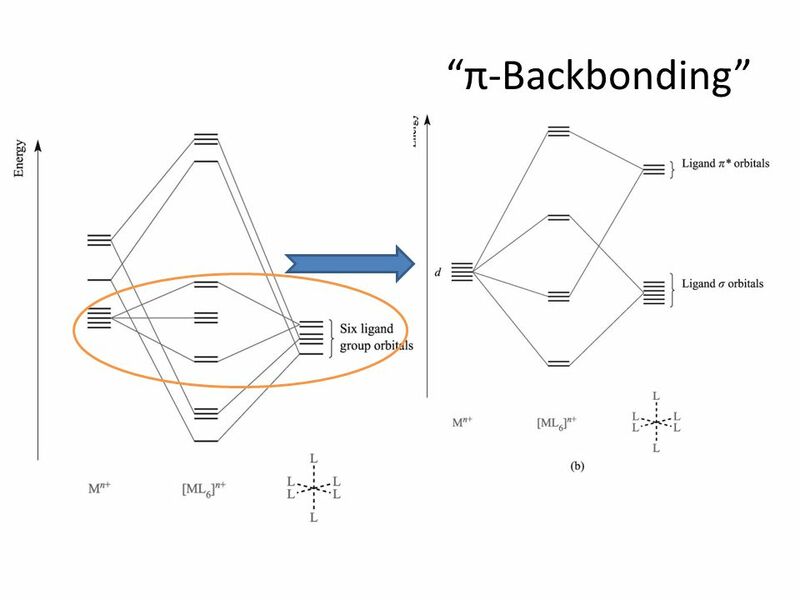 We call this π-backbonding ! 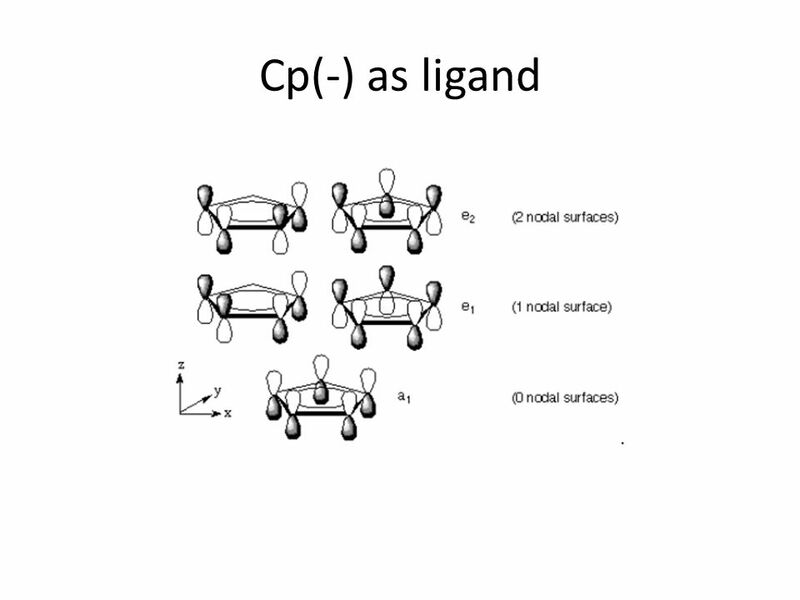 48 Each CO ligand has two empty π* orbitals. 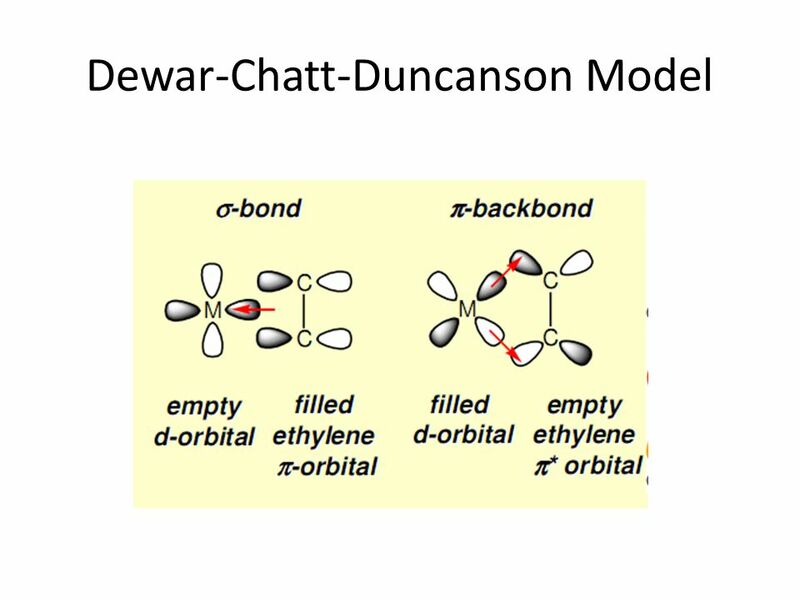 They can accept electrons from a metal d-orbital (dxy, dxz, dyz) ! 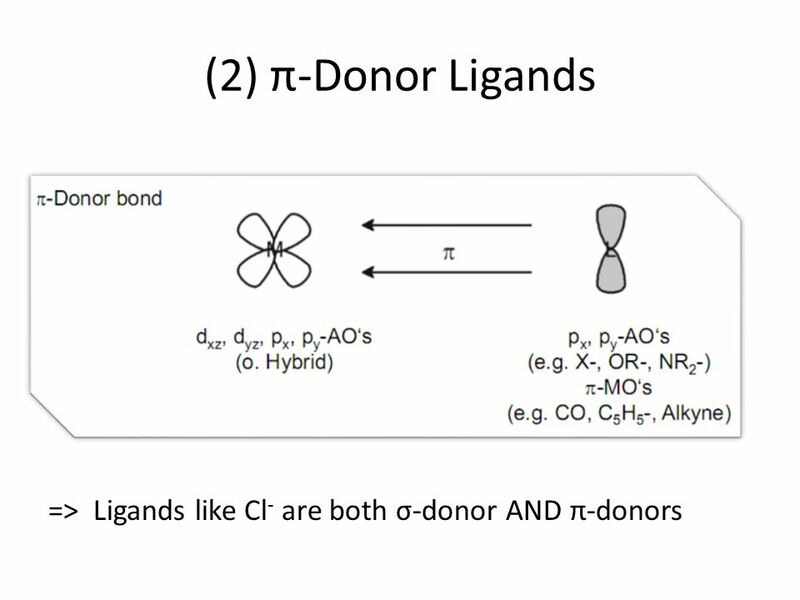 Because of the HOMO the CO ligand has high electron density on the carbon => can act as σ-donor as well ! 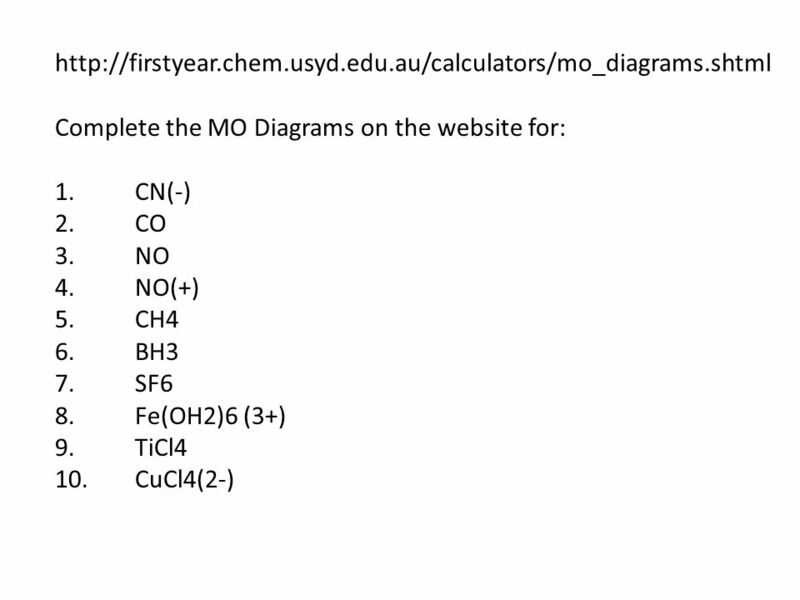 53 Complete the MO Diagrams on this website for different molecules as group work (see list on the office door) Draw on paper or print it out -> to office SC 2201 please until 24.1.2555, thank you ! 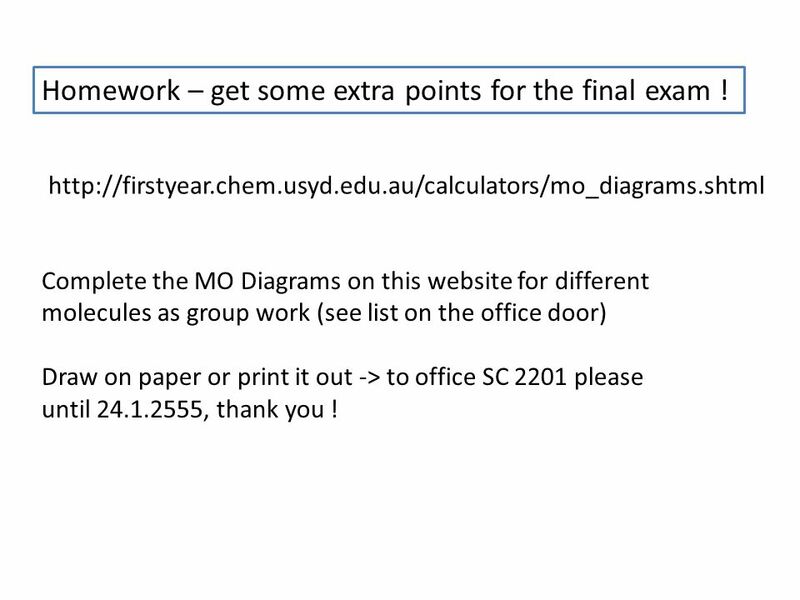 http://firstyear.chem.usyd.edu.au/calculators/mo_diagrams.shtml Homework – get some extra points for the final exam ! 54 Thank you for your patience ! 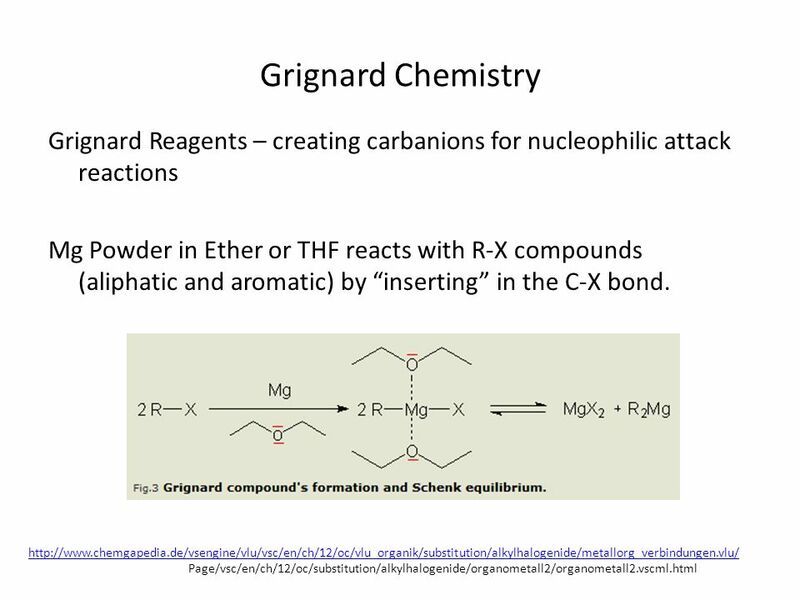 This subject is really hard to understand in a short time. Therefore I suggest we will have a make-up lesson in February. 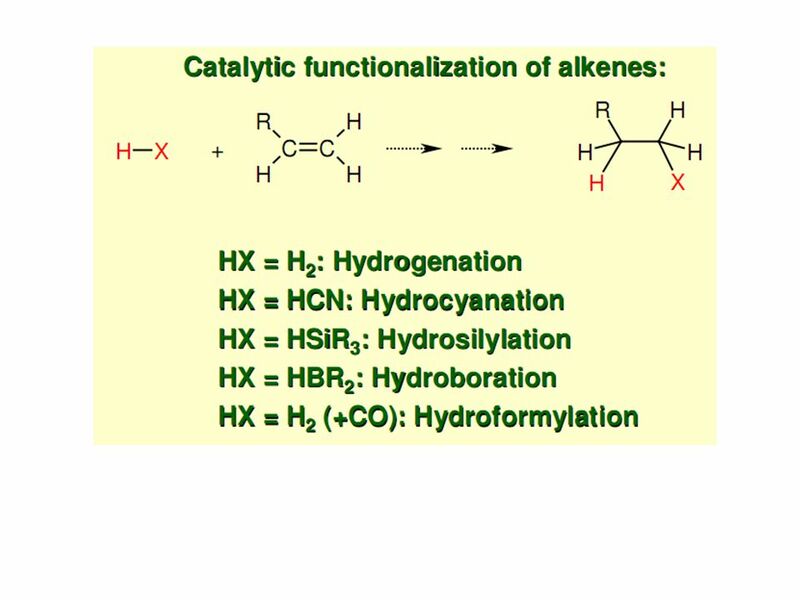 If you are interested in catalysis, please contact me or another teacher for a possible project in the lab – thank you ! Thank you for your patience ! 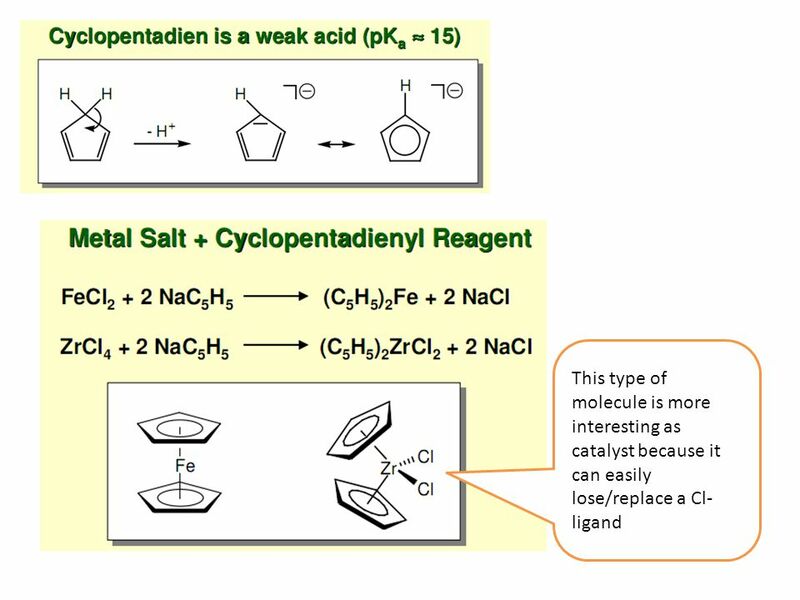 This subject is really hard to understand in a short time. Therefore I suggest we will have a make-up lesson in February. 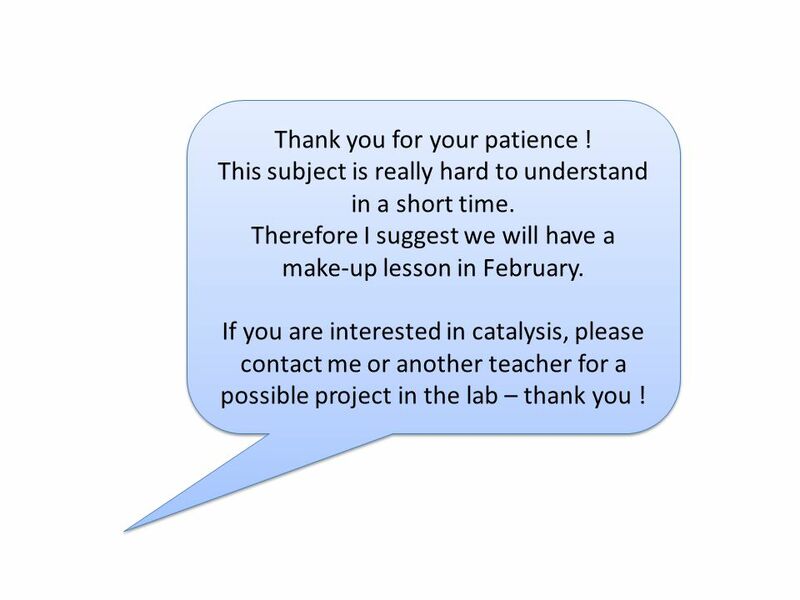 If you are interested in catalysis, please contact me or another teacher for a possible project in the lab – thank you ! 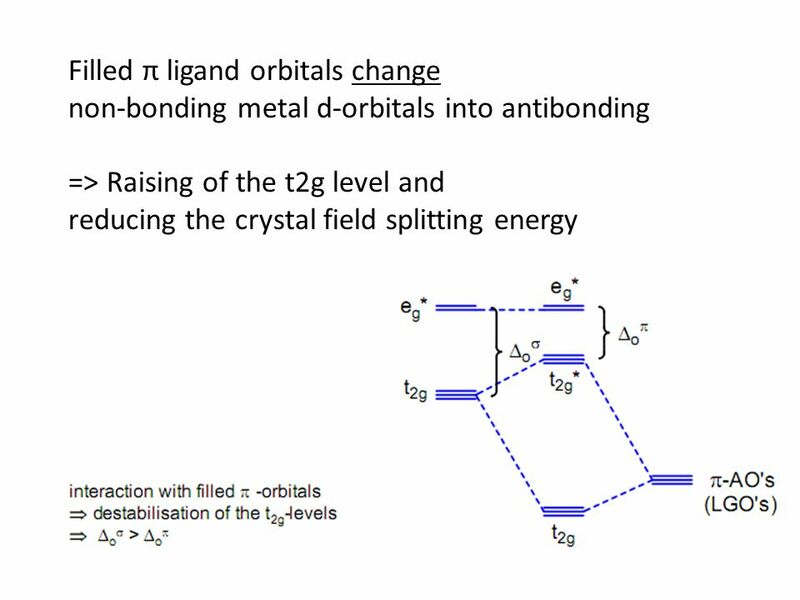 Download ppt "Structure, Properties and Bonding of Organometallic Compounds Dr. Christoph Jan.2012." 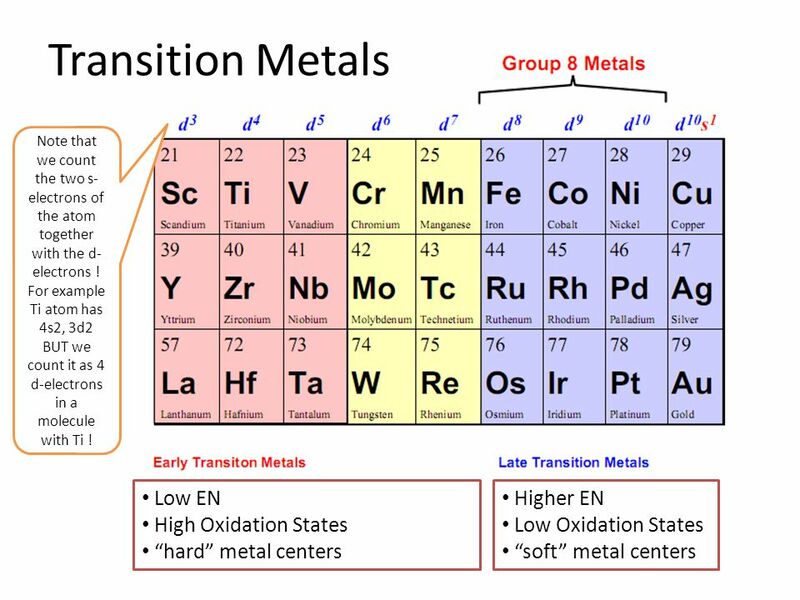 Transition Metals Mercury (Hg) is the only transition metal that is not a solid. 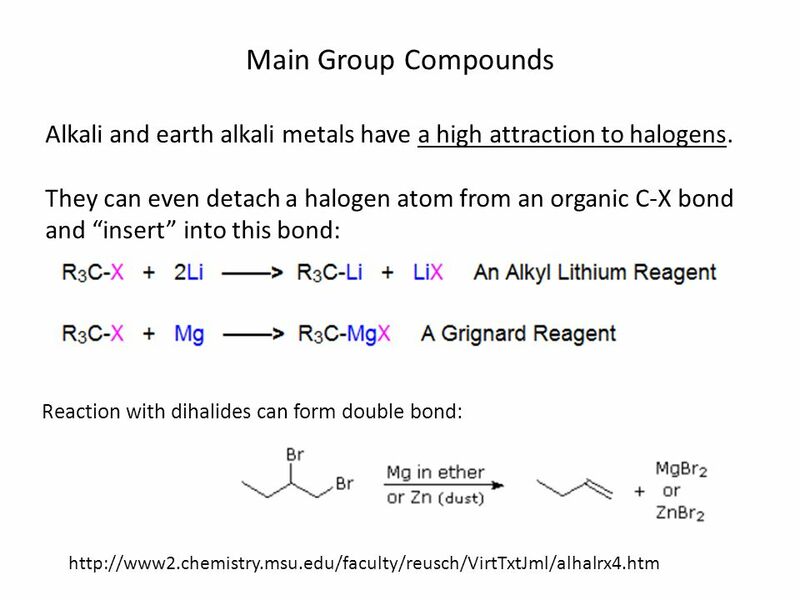 The transition metals all have valence electrons in a d subshell. Like. 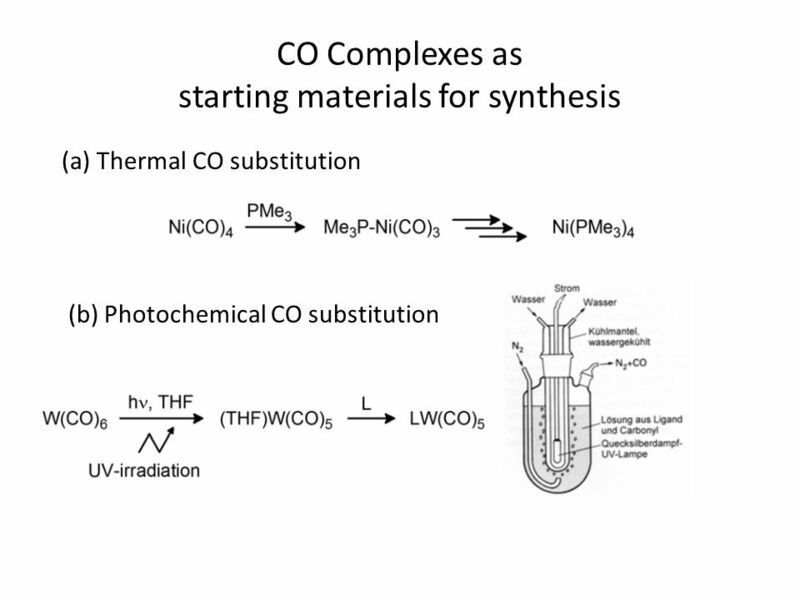 Imperial College London Dr. Ed Marshall, M220, RCS 1 Additional materials available on: Lecture. 4th period d-block elements 4th Period. 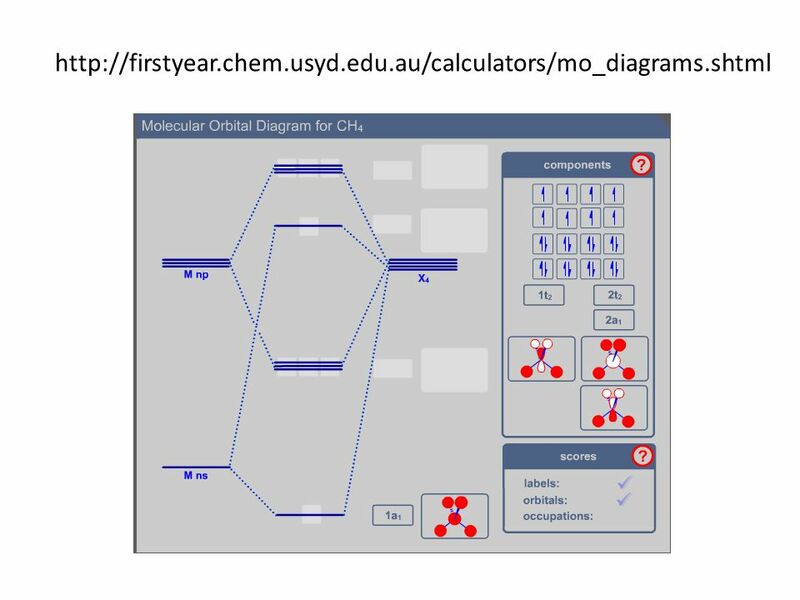 d-block elements  center block of periodic table transition elements d-sub level partially filled in one or more. 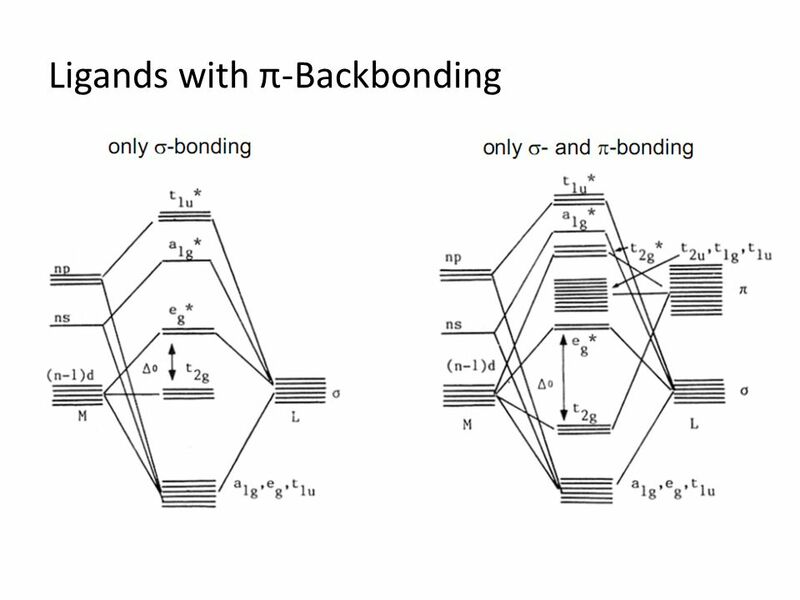 The one that is lower in energy is called the bonding orbital, The one higher in energy is called an antibonding orbital. These two. 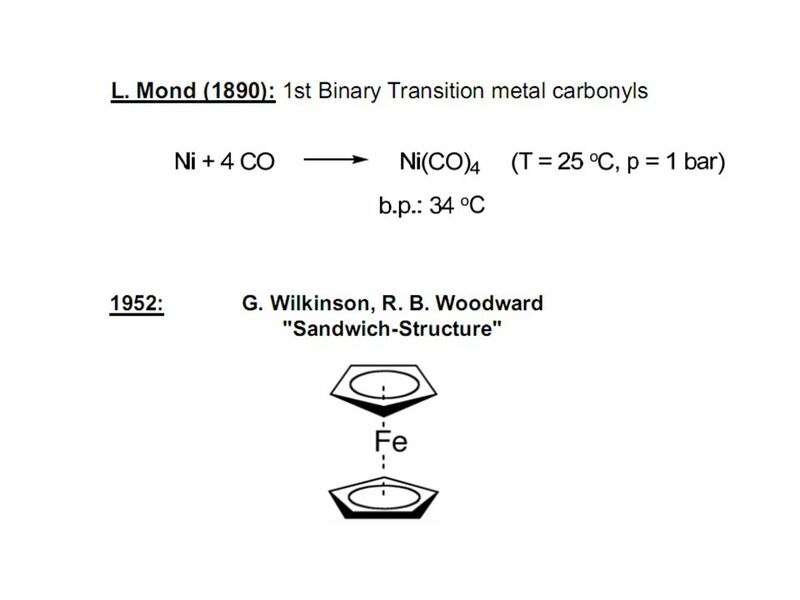 Photoelectron Spectroscopy Lecture 9: Core Ionizations –Information from core ionization data –Separating charge and overlap effects Jolly’s LOIP Model. 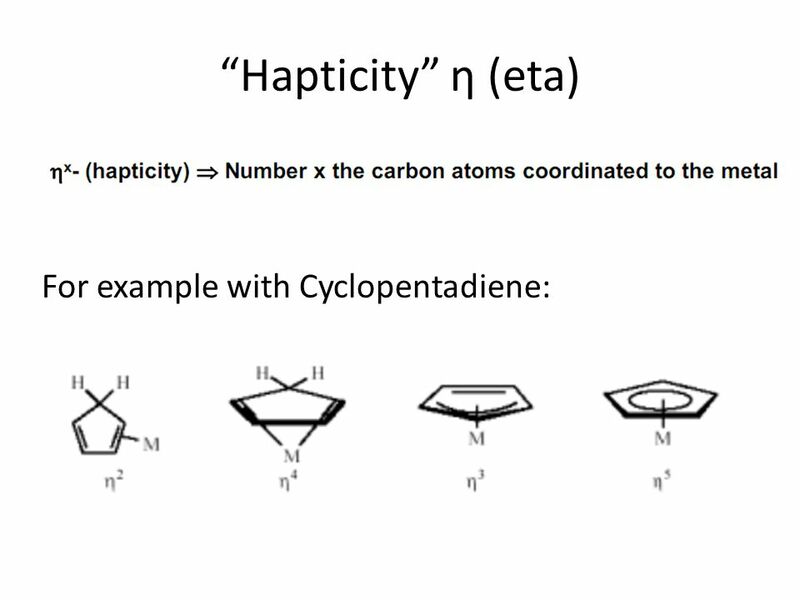 Chapter 9 Molecular Geometry and Bonding Theories CHEMISTRY The Central Science 9th Edition David P. White. Bonding in chemicals VELS 6. 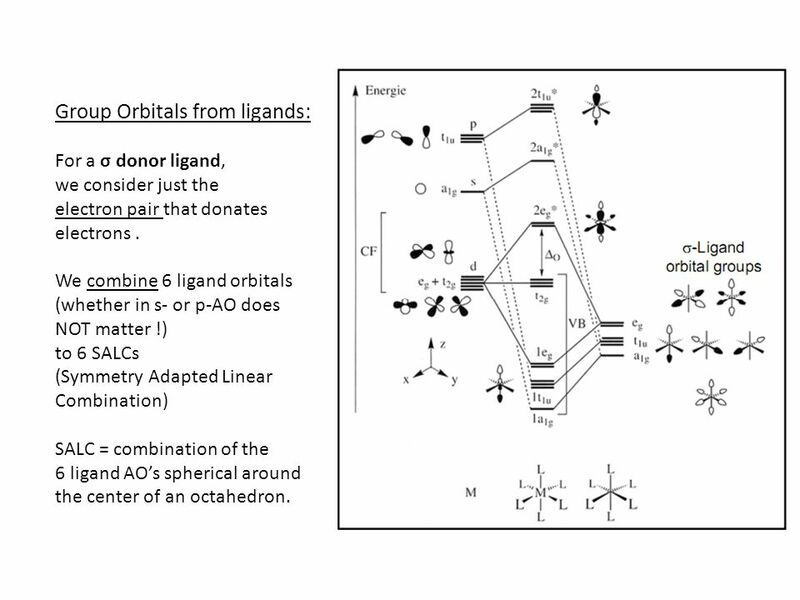 2-1 Orbitals and energetics Bonding and structure Ligand field theory Charge Transfer Molecular orbital theory Provide fundamental understanding of chemistry. 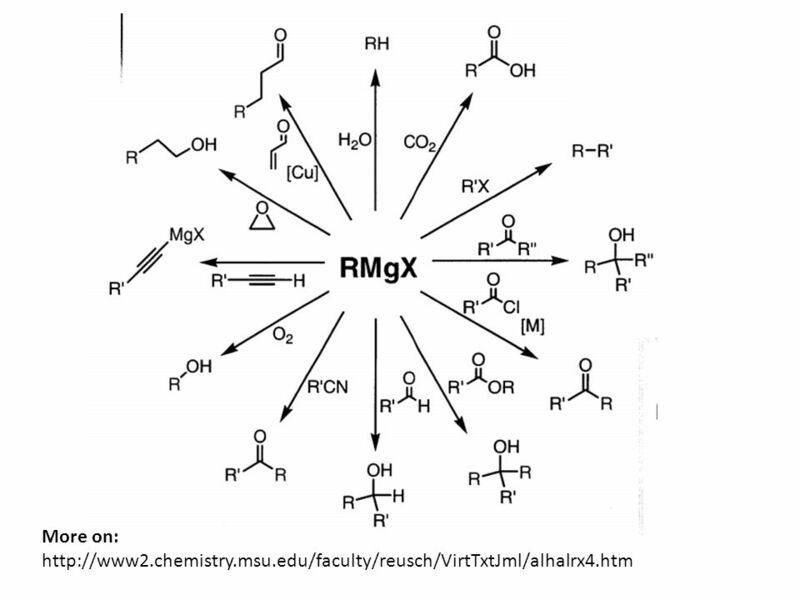 Organic Reactions Dr. M. Abd-Elhakeem Faculty of Biotechnology Organic Chemistry Chapter 3. 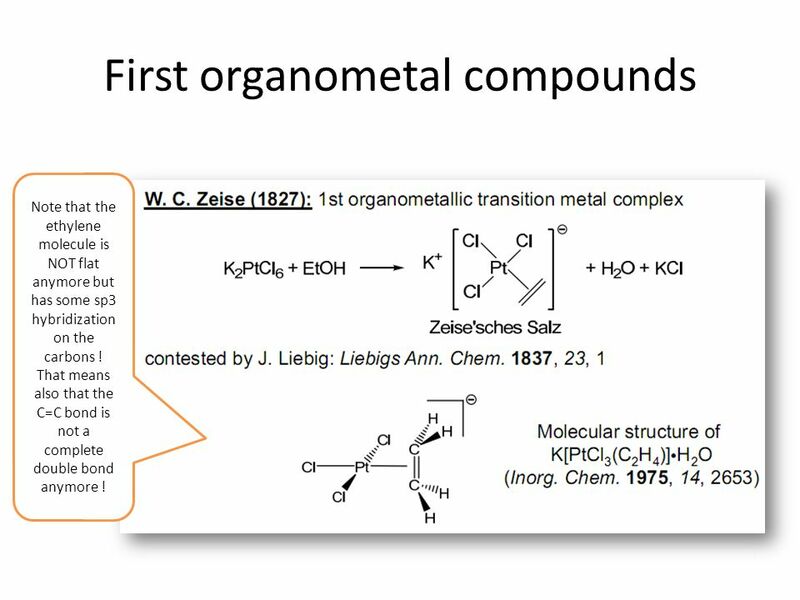 Main-group Organometallics Peter H.M. Budzelaar. 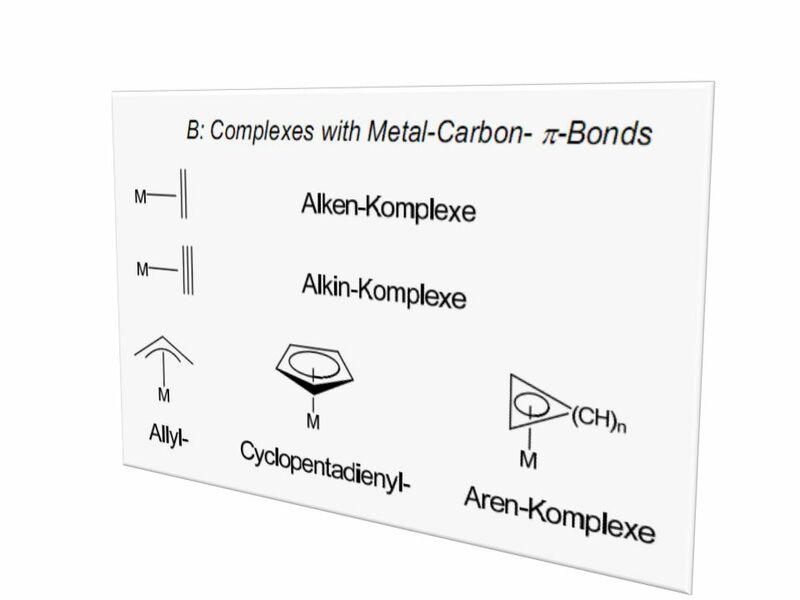 Main-Group Organometallics 2 Main group organometallics at a glance Structures –  bonds and 3c-2e (or.